Finding the best koi food for growth and color can be a little tricky. There’s a lot to think about. While providing the right natural ingredients to keep the reds and yellows vibrant and beautiful. It’s also important to choose a formula that’s designed for easy digestion and that will keep the pond water from getting cloudy. Don’t worry, there are a lot of options available that meet all these qualifications. What is the Best Koi Good for Growth & Color? When to Feed Koi Fish? How Much to Feed Koi Fish? If you’re looking for the best koi food to buy, take a closer look at these 6 great products. They’re some of the best on the market and provide balanced nutrition that supports both health and vibrant color. Plus, they also protect the integrity of the pond water. 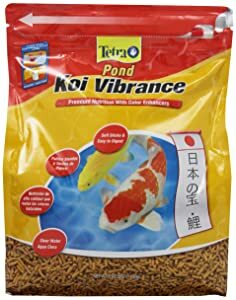 Koi Vibrance is a great food from Tetra that’s specially formulated to provide balanced nutrition to your koi while also enhancing bringing out their vibrant red and yellow colors naturally. This food is formulated for easy digestion. The soft sticks have hollow centers that are the perfect size and shape for koi and blended with the right amounts of protein, vitamins, and fiber for maximum metabolic efficiency. Because this food is so thoroughly digested, less waste is passed into the pond water which prevents pollution, algae growth, or cloudy water. This floating food from Kaytee is a great choice for koi and other pond fish. 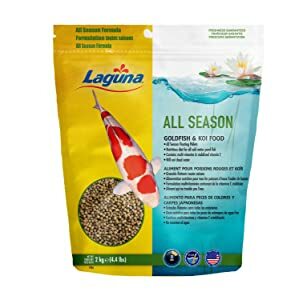 It contains an essential blend of animal and vegetable proteins and provides everything koi need for adequate growth and vibrant color as well as growth and longevity. Because this formula floats, it’s easy for fish to see. That means there’s less uneaten food that can sink to the bottom and alter the balance of the water. It’s also highly digestible so less waste passes through the fish to cloud or pollute the water. These pond sticks from Tetra Pond provide balanced nutrition to various sizes of koi and other pond fish. They float so koi can easily spot them and they’re always within reach. When they hit the water, they soften slightly so both small and large fish can eat them without difficulty. That’s not all, they’re also easy to digest which means less waste gets excreted into the water which keeps it clean and clear. With a perfect blend of vitamins, protein, fat, and fiber, this formula provides the right nutrition for energy, longevity, growth, metabolism, and overall good health. Next up in our reviews are these pellets made by HARTZ. They’re lightweight and float on the surface of the water to keep them easily visible for koi. This means less uneaten food left behind to sink to the bottom of the pond and contaminate the water. This food is highly digestible which means less waste plus it contains no dyes or artificial colors. There’s a good blend of vitamins, minerals, fat, and fiber in this recipe and most of the protein comes from fish meal. In fact, it has more fish meal in it than most leading brands. The protein to fat ratio is ideal for supporting growth. That’s not all, it also includes stable Vitamin C for immune system protection. 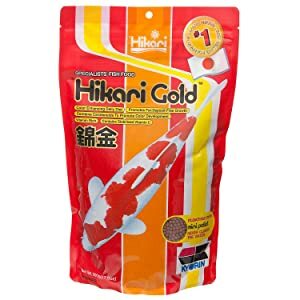 Hikari Gold has scientifically proven nutrition that gives koi exactly what they need to survive in captivity. The perfect blend of protein and nutrients meets all dietary needs and is even formulated to enhance color. Stabilized Vitamin C helps support immune system health, too, so this food helps koi look and feel their best. 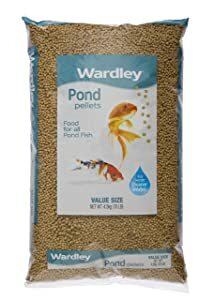 These pellets float which makes it easily accessible for the koi and lets you monitor their intake so you can make sure you’re not overfeeding. Plus, it keeps the water clean and clear so there’s less chance of algae growth or pollution. Last up is this high protein formula from Laguna that’s great for all seasons. It’s a medium-sized floating pellet that softens quickly when it’s in the water for easy eating and digestion. 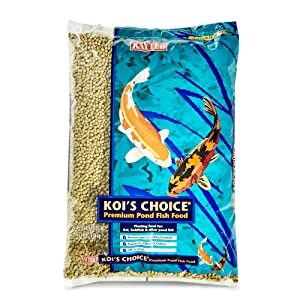 The balanced nutritional formula is perfect for koi and includes a minimum of 32% protein to provide the rich diet needed at certain times of the year. It also contains the perfect blend of vitamins, minerals, and amino acids to support year-round dietary needs as well as stabilized Vitamin C for immune system support. Our pick for the best koi food that supports both growth and color is TetraPond Floating Koi Sticks. It’s formulated with exactly what koi need for healthy growth and a strong immune system and has natural color enhancers that bring out their vibrant reds and yellows. The sticks are hollow in the middle for easy digestion and are designed for maximum metabolic efficiency. That means less waste passed from the koi to the water to prevent pollution, algae growth, or cloudiness. Feeding koi isn’t quite as simple as feeding aquarium fish. They’re more than just a fish, they’re an important part to the delicate balance of the pond ecosystem. Feeding koi correctly is essential not only to keep them healthy but to keep the pond healthy as a whole. Not only do you have to make sure you use the right food, you have to make sure you feed them the right way. A big part of that concerns when you actually feed them. With koi, it’s a little more complicated than “just feed them twice a day”. There are a lot of things to consider to determine the right time to feed koi. Before we get into details, it’s important to understand a little about the biology of koi. Something you might not realize if you’re new to koi is that they don’t have stomachs. That means that their digestion is very much influenced by outside factors. Another thing to remember about them is they’re cold-blooded which means they also can’t control their own body temperature. These two characteristics mean that koi are very dependent on having the right environment to thrive. While they manage on their own in the wild, a backyard pond isn’t really a natural environment which means that you as the pet owner has to be meticulous about controlling the environment and responding to give your koi the best possible chance to thrive. One of the most important things to monitor is temperature. Because koi are cold-blooded, the water temperature affects their metabolism. Cold temperatures slow it down, hot temperatures speed it up. Basically, that means that they’re very hungry in the summer because they’re burning so much energy. Conversely, in the winter, they won’t eat much at all because they’re hardly burning anything. In order to determine when to feed koi, there are a few things to consider. Size is important. Smaller fish need less food than larger fish. You also have to keep the climate in mind. Koi who live in a climate that’s mild in the winter will continue to get regular feedings in the cooler months while those in extreme cold will have a drastically different feeding schedule from season to season. After a long winter, you might be eager to feed your koi at the first sign of spring but it’s best to wait until the water has reached a temperature of 48 degrees F. As the temperature rises, the koi’s metabolism speeds up and they’ll require more food. As the year goes on and fall approaches, the temperature will drop again and you can cut back on feeding. Keep reading, we’ll get into more specifics. As we already mentioned, how much koi need to eat will depend on the water temperature because it directly affects their metabolism. A safe estimate is to give koi only what they will consume in 3 to 5 minutes with each feeding. That vary a lot from season to season in 2 ways. First, they won’t need feeding as often in the colder months. Second, they might not eat as much in the 3 to 5-minute timespan in the cooler days of fall as they do in the peak of summer. This is one reason why using a food that floats on the surface is important. Not only does it help koi find food and keep waste from settling on the bottom, it also helps you monitor how much the fish are eating. If you notice that they’re pace seems to be slowing down and there’s a lot of pellets left at the end of the 3 to 5 minute period, try giving them a little less the next time. Another thing to keep in mind it that it’s better to overfeed than underfeed. Koi can handle being slightly underfed but overfeeding them is more dangerous because it could actually kill them. While temperature is always important when it comes to feeding koi, the thing it affects the most is how often you should actually feed koi. It’s very important that you always have an accurate temperature so you know what is best for the fish. We’re going to give you some basic guidelines as to how often you should feed koi based on water temperature but remember that there are other factors to consider. Smaller fish may eat less, larger fish may eat more. In the summer and/or when water temperatures are above 60 but lower than 85, koi can eat up to 4 times a day because their metabolism is up. Once the water gets about 85 or 90, koi have a hard time metabolizing. When it’s that hot, wait until late at night or early in the morning and check the water temperature and feed when it’s at an appropriate level. When temperatures are anywhere from 50 to 60 degrees F, feed once or twice a day. Stop feeding when the temperature goes below 50. Digestion can take 3 or 4 days at the temperature and overfeeding can occur with only a little bit of food every day. If they appear hungry, you can try a little food once or twice a week. Another thing to think about is that different foods are appropriate at different temperatures because koi are digesting at different speeds and using the nutrients differently. If the temperature is below 60 degrees F, stick to low protein foods, vegetables, squash, and fruit or any food that’s approved for 3 or 4 seasons. As the water warms, slowly increase the amount of protein they’re getting. When the temperature reaches 80 or 85 degrees, feedings should be composed of about 40% protein to help them keep their energy up and to feed their fast metabolism. There are a lot of reasons why koi stop eating. Some are serious, some are not. First of all, it’s not as concerning if a koi isn’t eating at the end of fall or beginning or spring before the temperature has warmed up. Remember, if you live in a climate with extremely cold winters, koi will be working themselves into hibernation and will stop eating. This can be concerning but it’s perfectly normal. That said, koi that seem to have no appetite in the middle of the hot summer are a little more concerning. Remember, koi don’t control their metabolism so it’s likely that whatever is causing the lack of appetite is something you can fix. Here are some common reasons why koi might stop eating and what you can do to fix it. 1. Water quality. If none of your koi are interesting in food, there’s a good chance there’s something going on in the environment that’s causing the problem. The easiest fix is to check the temperature of the water. Remember, koi rely on water temperature for metabolizing food. Even if the outside temperature is hot, the water temperature might not be. Or, it might just be the first time the temperature dropped low enough between summer and fall to have an effect on the fish. It’s also possible that there’s a bigger problem involving water quality. Testing the water can help figure out exactly what is off so you can take the appropriate actions to fix it. Koi are very sensitive to sudden spikes and drops of various things. Make sure to check ammonia, nitrites, and pH as these are most likely to be off and lead to problems with appetite. 2. Stress. In addition to being caused by a drop in water quality, other things can cause stress, too. A sudden change in environment can have the same effect. This can happen from predators like ducks or other waterfowl invading their space or even something as simple as rearranging the plants and decorations in and around the tank. Hopefully, minor stressors will sort themselves out in a day or two and everything will return to normal. Keep in mind that if your fish aren’t eating and you continue to offer them food, waste products will soon build up as the uneaten food sinks to the bottom of the tank and begins to decompose. Be mindful of how much food isn’t getting eaten and check ammonia, nitrate, and pH levels as needed. 3. Illness. If you notice one of your koi has started to separate from the group and seems to have lost its appetite, it’s a safe bet that koi is sick. It could be from bacteria, parasites, or some kind of injury but isolating themselves from the group is natural behavior. During this time, sick koi will attempt to heal and grow stronger. After a few days or weeks, they should return to the rest of the school and begin eating again. If not, they may need additional attention and care, possibly even medication. If you notice any sluggishness, loss of color, or visible sores or injuries, it might be a good idea to treat the water with a wide-ranging parasite treatment. 4. Food. This doesn’t really have anything to do with the quality of the food you’re using, more that the koi might just be getting bored with it. Maybe it doesn’t have the right amount of high-quality ingredients or maybe they just want something else. You can try changing the food you’re using completely or try adding a few fresh fruits and vegetables to mix it up a little bit. Making sure koi eat properly is complicated. It’s definitely not as simple as dropping some flakes into the pond and assuming that they’re getting what they need. In fact, there are two major things to consider: the right food and the right method. 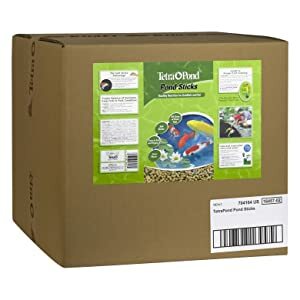 As for the best food, we highly recommend all of the products we reviewed but our top pick is TetraPond Floating Koi Sticks. It’s nutritionally balanced to support healthy growth, a strong immune system, and beautiful colors. We also like that it’s easy to digest and helps maintain water quality. Once you have decided on the right kind of food, it’s important to understand the koi’s biology. Because they don’t have stomachs and are cold-blooded and unable to regulate their own metabolism, water temperature is the most important determinant of when and how much to feed. Remember, colder temperatures require less protein because their metabolism isn’t working as fast. Feed sparingly once the water temperature gets below 50 degrees, only one or twice a week if needed. As the water gets colder, don’t be shocked when your koi stop eating altogether. In cold climates, they’re preparing for hibernation and don’t need the energy. If it’s the middle of summer and they seem to have lost their appetite, there may be something else going on. Check for signs of illness and test the water to make sure everything is measuring as it should be. Koi depend on you to provide them the nutrients they need when they need it. Because a backyard pond isn’t a natural habitat, they’re completely dependent on you to give them what they need to thrive. Making sure you have the right food is an excellent start. Your top pick, (Tetra Pond Koi Vibrance Premium Nutrition With Color Enhancers) does it float or sink? Yes they float. My fish like them. These are really great tips, thank you for this so much!